★★★★☆ Be the first to leave a review! Double beds, bunting, fluffy pillows… there are always a few things to be expected when you book a luxury bell tent stay. But you know you’re doing glamping right, when the gin van shows up. Serving local tipple from across Sussex, including beers from nearby Horsham, cider from Cowford and gin from Brighton, Chilgrove and the Blackdown Hills, the evening arrival of this mobile bar, housed inside a vintage Citroen horsebox, sums up the quirky, classy nature of Canvas & Stars. This is glamping with a capital ‘G’. Set in a secluded segment of the spacious and scenic Hale Farm Campsite – a working farm where kiddies can get up close with the animals each morning, feeding rare breed pigs, donkeys and lambs – Canvas & Stars is a new luxury offering (though already being lauded by The Telegraph as one of the UK's top mild camping sites) set within its own private space. 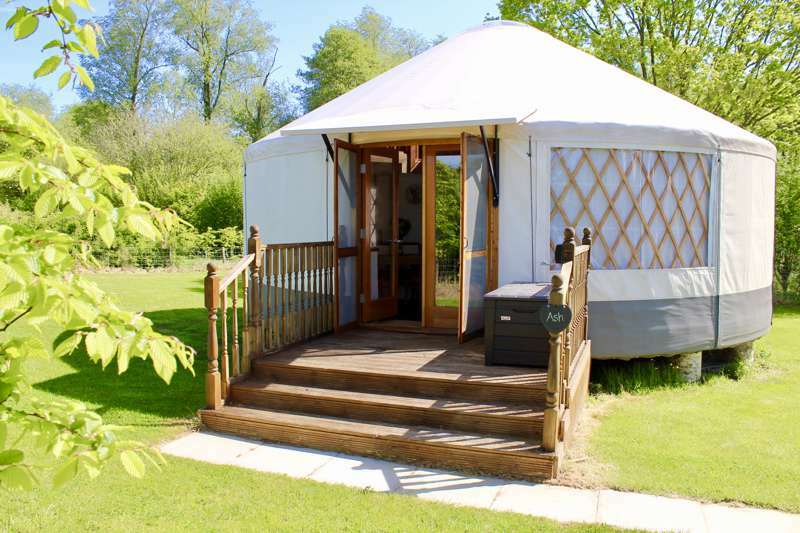 Their ‘bell village’ comprises 10 fully furnished tents, with beds for a family of up to five people, and an eleventh, communal tent with board games, books and magazines in case the weather turns. Outside, meanwhile, every tent has its own campfire pit and deck chairs, with access to a pop-up kitchen with all the utensils you need, either for cooking on a gas hob or on your open fire. While the attention to detail here is excellent – complimentary toiletries provided on arrival; a scavenger hunt and fancy dress rail for children in each bell tent; a gift for anyone celebrating a party – it’s still the more universal charms of the place that make it stand out. The two homely local pubs are a perfect case in point, both eminently walkable from the campsite down the quiet Sussex lane, while National Trust attractions and ancient castles seem to pop-up in every direction you drive. In all, it treads the ideal line between camping and luxury. Those essential elements of the outdoors are still there – the smell of campfire smoke, the morning stroll to the showers through dewy grass, the morning alarm of birdsong – but you’ve still got an incredibly comfortable bed to sleep in and a minimal amount of packing is required. All that, plus the gin van. Now that's the way to glamp! Each bell tent has a double bed and up to 3 singles (bedding and linen provided), bedside tables, fairy lights, bunting, rugs and complimentary toiletries, plus a firepit and grill outside. Facilities include compost toilets, flushing toilets, hot showers, washing-up sinks and a pop-up kitchen with table, chairs, hobs and all cooking utensils and cutlery you need. Electricity in the kitchen for freezing ice blocks and charging phones. 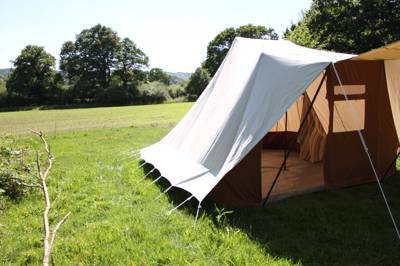 There is a communal chill out bell tent with games, books and bean bags, plus each tent comes included with a scavenger hunt for kids. Communal firepit area with deck chairs and blankets. Children can visit the farm animals between 9am–10.30am. They include donkeys; a pony; rare breed Oxford, Sandy and Black pigs; chickens, geese and ducks; Pygmy goats; and flocks of Lleyn and Ryeland sheep. Free parking. The High Weald and the South Downs are the best places to go walking nearby – though the footpaths directly from the site are not to be sniffed at. Arlington Reservoir is about a 10 minute drive, a good spot for bird watching, while a few hundred metres further is Drusillas Park (01323 874100), a small 10 acres zoo mainly aimed at children. National Trust owned Batemans (01435 882302), former home of Rudyard Kipling, is around 15 minutes in the car, as is Alfriston Clergy House, the very first property the Trust bought back in 1896, before becoming the cherished charity it is today. 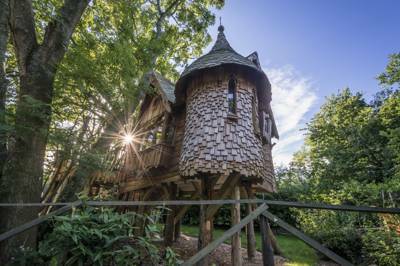 Herstmonceux Castle (01323 834457), Sheffield Park and Lewes Castle (01273 486290) offer further heritage and are all within half an hour's drive, while, families, will particularly like Knock Hatch Adventure Park (01323 442051), Ashdown Llama Park (01825 713698) and the Observatory Science Centre (01323 832731). A mobile gin bar visits the site almost every evening, offering gin cocktails, prosecco and beer. A range of luxury breakfast hampers and locally produced sparkling wine are also available to purchase and there is a small village store within walking distance (around 10 minutes). There are also a pair of excellent pubs in Chiddingly, The Six Bells (01825 872227) and The Gun (01825 872361). From the A22 turn north at the Esso garage in Golden Cross and continue to Muddles Green. In Muddles Green turn right and after 300 yards turn left into Scrapers Hill. Proceed along this for about 2/3 of a mile and Hale Farm is on the right-hand side. From Horam take the road South to Eastbourne. After about 1/2 mile turn right just before the May Garland Pub. After 3/4 mile turn right again in front of a converted last house,signposted Chiddingly. After about 1.5 miles Hale Farm can be found on the left-hand side. Best to bring a car – the nearest train station is in Berwick (0845 748 4950), 5 miles away. 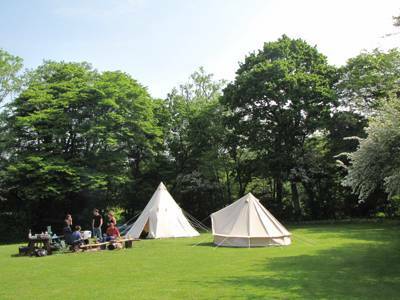 10 furnished bell tents, sleeping up to 5 (max 4 adults/3 children).